I realize it is the rainy season and the potholes are only going to get worse but the state of some of the roads is quite bad. I have seen the water company dig up the road near my house several times and then just leave it. Do they not inform the city that the road needs to be repaired? Do they not have any responsibility to the city to make sure the road they just destroyed gets fixed? For those of us on motorcycles, these potholes are especially dangerous in the rain since we can’t see how deep they are when we hit. And coming to road crew, I was coming up the road near Fabrique when the electric company was fixing something, blocking one entire lane. There were no flag men (or women for that matter) and it was a free for all of traffic trying to get past. Surely the electric company has sufficient funds to send one extra person out there to man the road and allow traffic to flow? I read in the last issue that the Province is hoping to obtain municipal status, well if it means that all these different groups will finally coordinate their activities, I am all for it. 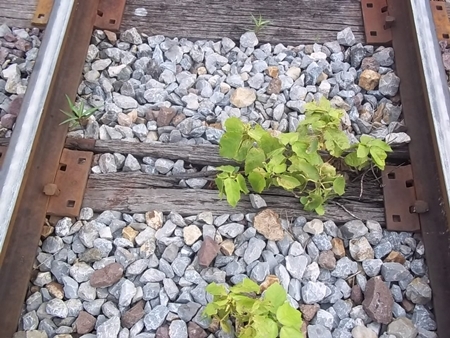 The timber sleepers at Sarapee are rotting and broken in this recent photo. How safe are we on Thailand’s narrow gauge railways, with the inherent instability that causes at any speed? When I see news of horrific accidents in India and a recent high speed smash in China, the only comfort I have is in the Slow Railways of Thailand. South of Chiang Mai city at Sarapee (in fact a fast section of track) we can all see broken and rotting timber sleepers (‘ties’) which in very many cases are totally detached from the rails! The weight of trains, especially the locomotives, tries to force the rails apart and the job of these items is to firmly hold them together. The rest of the world steadily switched to concrete sleepers decades ago, but Thailand still relies very heavily (pun intended) on weak and useless old wood. Most derailments in Thailand are caused by heavy rains washing away the essential gravel which underpins rails and sleepers. And we still have many weeks of the rainy season to go. It was with great interest I read your headline article in the last issue. As an American I find the system of government here very odd. Why does it seem like so many decisions that should be made locally are made in Bangkok? And why does so much of Chiang Mai’s revenue go to Bangkok to be determined how it is spent? If this is an attempt to reduce local corruption then it seems like it may just encourage national corruption instead! And while I am not sure why they need to have a color to represent their aims of semi-autonomy for Chiang Mai I do understand their desires. I don’t consider myself a ‘states rights’ activist in the US but the states in the US do have a far greater level of autonomy and self-determination than Thailand’s provinces. Shouldn’t the people who live there have a good idea of what they need?